For this T-SQL Tuesday we are asked to look into our crystal SQL Server ball and predict what will be happening at the time of T-SQL Tuesday #200. I went to the garage, dug that thing out, cleaned it up, and boy it had a lot to say! T-SQL and JSON had a baby. All queries in SSMS resemble a hybrid of the two languages. SSDT has been replaced by VSDT. Nothing has really changed but the acronym. As always, you can still expect some things to break when you do updates. Microsoft bought NHibernate. You still have all the same issues as before but now you post them to Microsoft Party (it replaced Collaborate…after that replaced Connect) and actually watch them not get fixed. And you can’t post work-arounds in MS Party (so it’s not much of a party). MS NHibernate still generates SQL queries that are long and redundant, but it’s not handling the TSQL-JSON baby very well. So there’s that. Microsoft acquired ActiveBatch and it is now called SQL Server Batch and has replaced SQL Server Agent for scheduling jobs in SQL Server 2026. Consequently, companies have been reluctant to upgrade from SQL Server 2023 (especially the ones that have used ActiveBatch). For the companies that are upgrading, they have found that calling PowerShell scripts from scheduled tasks to be a good way to bypass using SQL Server Batch. Increase the in the demand for DBA’s with extensive PowerShell experience sky rockets! The rumors back in 2018 proved to be unfounded – DBA’s are still in high demand. All the talk of SQL Server tuning itself turned out to be DTA 2.0. Microsoft brought back the MCM. And then killed it again the next year. Azure has been replaced by Rainbow. Data is no longer in the “cloud” – it is in “rainbows.” Pricing is based on the colors of the rainbow and the color names are garnet, citron, lemon, lime, azure, and violet. PASS still exists. Due to some bylaw changes, elections have not been held since 2019. Grant Fritchey [B|T] is still president and attends meetings remotely from his nursing home. Just kidding – Grant’s not in a nursing home. That’s just where he says he is. There was some backlash when PASS did away with SQL Saturday events. Grant’s really in witness protection and goes by the name Thomas LaRock [B|T]. Thanks to Adam Machanic [B|T] for hosting the T-SQL Tuesday this month, and for coming up with this whole thing to inspire all of us to write more and continue to share knowledge. While there was absolutely no knowledge in this post, I do hope that I got a giggle from at least one person. When performance issues rear their pretty little heads I tend to look at the simplest things last. I am the person who is looking at the code first – because in many cases, if your code was better we wouldn’t be having this discussion. Whether it’s a series of nested views or one single user-defined function that doesn’t play well with the optimizer, there is usually something in the code itself that is contributing to the performance issue. But what about the times when it isn’t the code or you can’t touch the code (I’m looking at you NHibernate…and all of your red-headed step-child offshoots and fellow ORMs). What about the cases when the poor performance situation only occurs periodically, or once a week on the same day, every week, and while you can see the slow-downs in your queries, and all of your waits and plans, the source of the problem isn’t any particular smoking gun – it’s lots of guns, firing off at random times, and the casualties are in your interfaces that depend on the data from the queries. The one thing I don’t immediately go to is UPDATE STATS – and I should be looking at this. It’s something easy to run and if you still have issues, you have ruled it out. 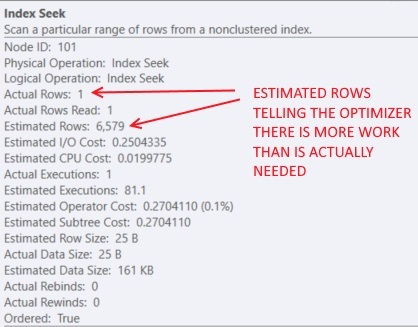 Over estimation on rows = bad times for the optimizer. 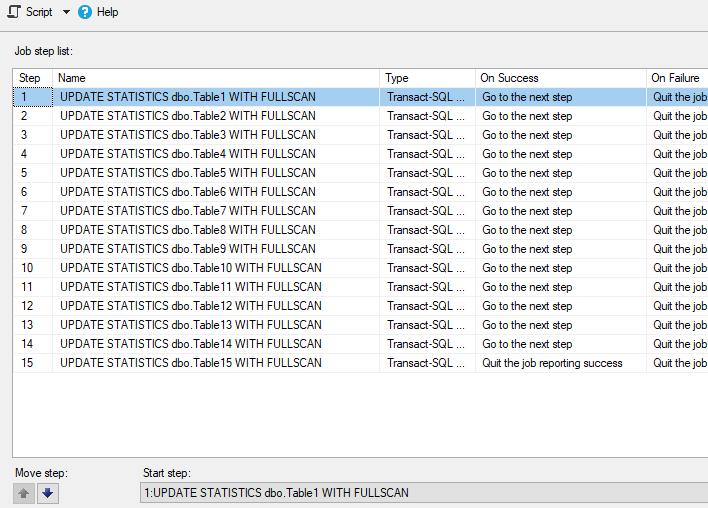 In this case, I ran UPDATE STATS on one table in particular and immediately saw a marked improvement in my test query. 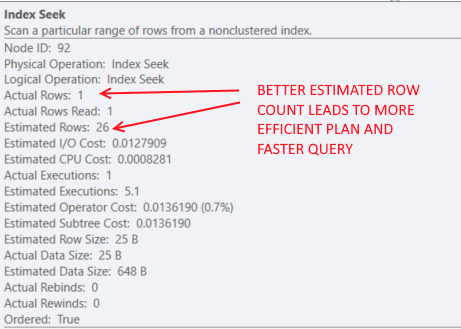 This morning I ran the same query and things were back to where they were with performance. This was somewhat disheartening, but the troubleshooting must continue. But what about auto-update stats? Is this on? 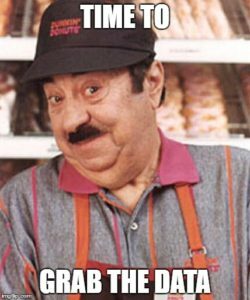 Yes, but auto update statistics is only going to update based on a percentage sample of the records in the table. If your table contains millions of records, you may not be updating your statistics sufficiently to see an improvement. I am updating statistics with a FULL SCAN of the table. For larger tables, this may take some time, but you may also see a difference in your execution plan versus only updating statistics based on a sample. In an effort to rule out whether or not statistics are definitely a factor, I want to UPDATE STATS on all the tables in my query, and at a specific time – sometime the day before we expect our slowdown to occur. I also want to be able to easily see how long the process ran and the duration of the update for each table. I could write all this to a table, and maybe I will do this later, but viewing this from job history is what I want right now – it is easy to look at and easy for everyone else to find and see as well. Creating a job with multiple steps can sometimes be a bit painful and tedious, if the job is going to have A LOT of steps. With PowerShell, a server name and a database, I can dynamically create this job. Purpose: With a specified server, database and list of tables, create a job to update stats. The result from this is a job that will update statistics on your list of tables, one at a time. All you have to do from there is give it a schedule. All those steps…courtesy of the magic that is POWERSHELL! For this script, I was getting my list of tables based on a specific query that was problematic. If you are doing this for a stored procedure, you can query for the list of dependent tables instead, and instead of hard coding the tables in this code, pass in the name of your stored procedure and get the list that way. Blocking – I Saw What YOU Did and I Know Who YOU Are! When I was growing up I remember my mom talking about an old, scary, movie that she saw when she was young. In the movie some teenagers were making prank phone calls saying “I saw what you did and I know who you are.” One of the calls happened to be made to a guy that just killed his wife. Joan Crawford played a woman that was romantically inclined to said murderer. She eventually meets her demise when he stabs her because she knew about the first murder. 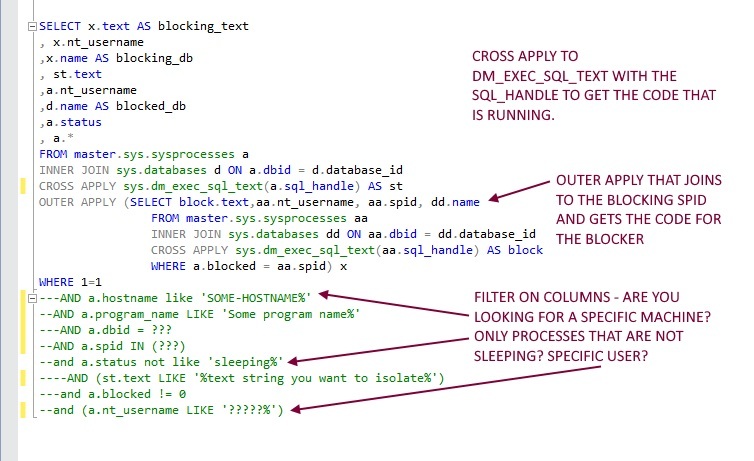 While blocking in SQL server might not be a felony offense (it isn’t…but it should be – WHO’S WITH ME?) as the DBA you not only want to know what is being blocked, but also who is doing the blocking and what in the H-E-Double-Hockey-Sticks they are doing. At SQL Saturday Orlando I talked about this very thing and the query I defer to for the information. IMA GONNA HUNT U DOWN! WHY ARE YOU BLOCKING YOURSELF? WHY ARE YOU BLOCKING YOURSELF? WHY ARE YOU BLOCKING YOURSELF? If you are looking for a good way to troubleshoot blocking I hope this helps. If you have some folks running queries that are making you stabby, run this, find out what is going on, and then remove their access try to help them so they aren’t making you stabby any more. Then tell them they need to buy you a beverage because they are still alive. Next week I am returning to Orlando not only to visit the mouse at his house, but also to speak at SQL Saturday Orlando! Last year was my first time there and I had a great time. This also happened after the event was pushed back to November 2016 because of Hurricane Matthew. This year I will talking about deadlocking and blocking – something that is an issue for so many DBAs. Whether this issue is indexes or bad code…or you have been trying in use indexes to cover up bad code, blocks and deadlocks can happen in even the best environments under the right circumstances. If you are going to be at SQL Saturday Orlando come to my session where we will talk about detecting and preventing these arch enemies of the DBA! Abstract field is now varchar(max). ‘Cause precons get all the chars. Upper bound increased to include precons. Before I could get update #1 posted, it appeared all the general sessions and lightning talks were removed from the submissions page and replaced with submitted precons. 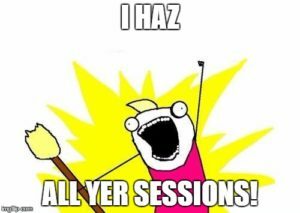 Don’t fret – the PowerShell script will still grab all the submitted sessions (for now). There were also some more precons added so the upper bound has been changed yet again. The deadline for PASS Summit submissions came and went. Either you got yours in or you didn’t. What does this mean? Time to gather the data. Go get it! You know you want to! Purpose: Pull down all the session submitted to PASS Summit 2017. Because data. And because you want to. Abstract field is now varchar(max). Cause precons get all the chars. Upper bound to include precons. $title = $resultArray -replace "'","''"
$speaker = $resultArray -replace "'","''"
$blurb2 = $blurb -replace "'","''"
There will also be some webids that error out – this means the session doesn’t exist for that specified webid. You will see an error in the output to the PowerShell window, but the script will keep running. Once you run the script and it completes, you will have your table of session data. You will notice that there are more sessions there than have been submitted, according to the website. If you do a count of the sessions by speaker you will also find that there are more than three sessions (the maximum allowed) for quite a few speakers. Why is this? You are pulling from a data source that contains sessions other than the ones that were submitted to Summit (apparently). This means you will have to clean up the data – I included the deleted field for this purpose. Look at the duration and filter for the 75 minute and 10 minute sessions and update your deleted field accordingly. After this, you will have sessions that meet the duration, but you will find the speaker is not listed on the submission site when doing an advanced search. Clean the data some more. Are you done cleansing your data yet? You might think so, but you aren’t. You see sessions that look like they were submitted for Summit but are not on the site. These appear to be sessions that were created and saved, but not officially submitted. You can rule out quite a few of these if you look for speakers that have more than three sessions. Get those counts, check the website for those speakers, and clean your data. There will be speakers that have three sessions in your table but only submitted one or two. This sounds worse than it is, but it is a little painful. How do you do this? You’re going to search the speakers with the advanced search on the website. Do these in groups based on the number of sessions a speaker has, ordering by speaker name. You can exclude the the speakers you have already reviewed in the previous clean-up steps, deleting their names from your list as you go. When you find a speaker with three sessions in your list and fewer sessions submitted, mark the session that was not submitted as deleted. Next, do the speakers with two sessions as they may have only submitted one. Finally, look at the speakers with one session as there may be ones that didn’t officially submit anything. No. You know how to do this, and may write it differently (and better) than me. My code was ugly and I don’t feel like cleaning it up and posting it here. I gave you the script to grab it all. Stop complaining or I will send you to time-out. The speaker info grab will be a separate blog post. With the script in this post you might be able to use the syntax and craft your own PowerShell script for this. Or you could wait for my blog on it. After whining about not blogging enough, I am going to do something about this. Whether it is PowerShell or SQL, simple or complex, I know that others can benefit from my knowledge and expand their skill sets. Recently I was tasked with gathering the system information from all of the servers at a client. Another opportunity for some PowerShell dominance. when you can't connect. Output information to a NFO file with the name of the machine. Notes: Get your list of servers and update the $servers variable below. Make sure they are also formatted the same way as in the sample. Update the $path variable with where you want to save the NFO files. With this script you can generate system information files and save them to a specified location. It makes sure a connection can be made to the server first, and then outputs the file. The files are created one at a time, so if you pass in a longer list of servers, you shouldn’t crash your machine. From my testing, this will take some time to run as these files don’t output quickly. Despite that, the output is worth it. This can be modified to pull your list of servers from a file or from a Central Management Server (CMS) instance.